For over threescore years Cyrus H. Gordon's scholarship and teaching have provided new directions to the study of the ancient Near East. This collection of 34 essays in honour of his 90th birthday, edited by three of his former pupils, celebrates his fascinating and remarkable achievements and reflects his broad command of ancient studies. The global impact of his research can be seen from the geographical dispersion of the outstanding scholars who have written here on the following topics: archaeology, Bible studies, Ugaritic, Aramaic, Arabic, Egypto-Semitic, the cuneiform world, Indo-European, Samaritan, the Graeco-Roman world, mediaeval studies. The inclusion of a complete bibliography of Gordon's works is of singular value. 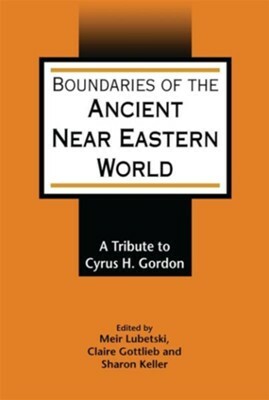 I'm the author/artist and I want to review Boundaries of the Ancient Near Eastern World: A Tribute to Cyrus H. Gordon.